Imagine being able to know the emotions of a person just by tasting something that that person has cooked. That is the gift, or perhaps the curse, that young Rose Edelstein discovers that she possesses when she bites into her mother’s lemon cake and is flooded with a great wash of sadness and longing. I thought that this sounded to be an intriguing topic. I “hungrily” (no pun intended) turned the pages, fascinated with Rose’s reactions to this mysterious, unsettling talent. Rose’s family life is delved into, and we come to know her beautiful mother, her workaholic father, and her mysterious brother, Joseph. What began as an engaging, somewhat magical story of tastes, feelings and relationships, veered a little off course somewhere in the middle, visiting the realm of really impossible. But Rose is such a likable character, the author writes so beautifully, and the concept is really a fresh and interesting one. I enjoyed this book, and it made for a good read. It would be a great discussion book for any book club. One warning though……it left me with a strong craving for lemon cake! 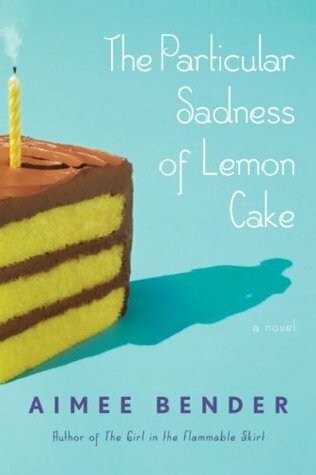 Hi Esther, The Particular Sadness of Lemon Cake sounds like it could be a Sarah Addison Allen’s book. Have you ever read her books? Is it similar? Hi Allison! Thanks for commenting on our blog! I love Sarah Addison Allen’s books and have read all three of them. I believe she has a new book coming out soon….something with “Peaches” in the title. The Particular Sadness of Lemon Cake was along the same lines as her books. Another of my favorite authors, Alice Hoffman, also writes with that supernatural, magical thread running through her books. I just read The Red Garden, her latest book. If you haven’t already read her books, try them! I agree about it veering somewhere off in the middle….into a place I just couldn’t realistically follow, actually. And, still I loved the book and it ended up being one of my favorite reads last year. But…that one storyline was REALLY odd. I so agree with you! I was certainly not expecting the story to go off in that direction!